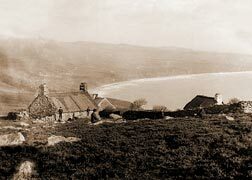 I Recently borrowed a whole bagful of old photographs from Mrs O Pritchard, from Aberdaron. They are really interesting e.g. Eleri Stores, Daron Cafe, school photos of Deunant, Llidiardau and Botwnnog and some photographs of seafarers who worked on the Roses ships of Amlwch, each one in it’s own unique way a real treasure. As everyone knows, we love old photographs, and there’s nothing better than having a good look in the old ‘biscuit tins’ that are home to so many fine images. I went through the photos with Mrs Pritchard, and one of them was really old and quite worn at the edges, and showing it’s age. It was a photograph of the Cobblers of Pensarn, Aberdaron, and Mrs Pritchard knew the name of one of the young apprentices William Jones, Penllech. 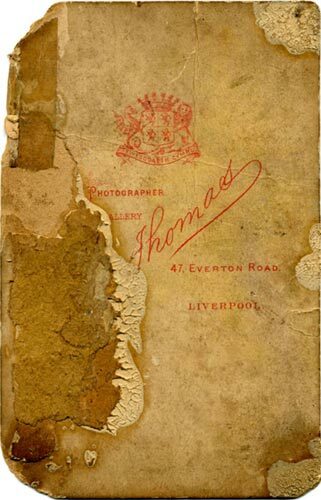 When I got home we took a closer look at the photograph and on the back we noticed that the surname of the photographer was Thomas and his studios were 47 Everton Road, Liverpool. The forename had faded into the mists of time, but we thought it could have been John. So we e-mailed the National library of Wales at Aberystwyth to see if our hunch was right. Lo and behold William Troughton of the National Library came back to us to confirm that yes John Thomas did have a studio at 47 Everton Road, Liverpool – talk about Wow Factor – but there was more to come this photograph wasn’t amongst the vast collection of over three thousand John Thomas images at the National Library. 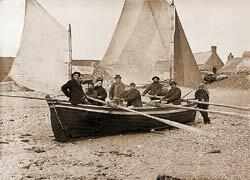 Some of his images are very familiar like the one of the Bardsey Fishermen sitting in their boat on Aberdaron beach, and the Rhiw, Parish Cottages image that we have had on Rhiw.com from the very first old photographs page. John Thomas travelled throughout Wales at the end of the nineteenth century taking photographs in towns and villages, mansions and crofts. We as a nation are indebted to him for recording so much of that period. And we are so chuffed and proud that we have been lent this image, and can share it with you all, it really is a treasure of social history. Gwenllian. John Thomas set up in business as a photographer on his own account in 1867. By ca.1880 he had moved to 47 Everton Road, though for a short period his photographs bore the legend “John Thomas, 47 Everton Road (late 66 St Anne Street, Liverpool) on the reverse. His business premises were referred to as “The Cambrian Gallery.” As this photograph has the address 47 Everton Road on the reverse it is likely it dates from the early 1880’s or 1890’s. Not all photographers were meticulous about dating their photographs, John Thomas being one. There were three strands to John Thomas's work. The first was a conventional studio for portrait photography in Liverpool. Secondly, he sold photographs of the Welsh celebrities of the day – bards, musicians, and ministers of religion through shops, markets and fairs. Thirdly, he also undertook trips to many of the remoter parts of Wales. These trips, which due to the nature of the equipment he carried with him, were almost expeditions. On these trips he photographed towns and villages, beauty spots and other important features. He also took group portraits of people at their workplaces, such as shops, factories and quarries. In his reminiscences he remarked that he would be sure always to visit these places at mid-day. This was both to use the best available light and to ensure that the workers were photographed during their lunch break so as not to upset their employers. 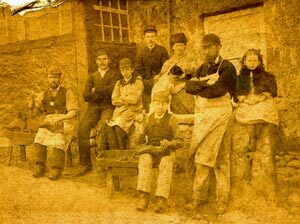 This photo of the cobblers at Pensarn seems to fit into this category. This was profitable work for photographers as very often one of those pictured would be willing to take orders, collect money from people and later distribute the finished product. You can view some of the collection here. Mrs O Pritchard, for the Pensarn photograph. Miss M Evans, for the Bardsey boat photograph. Mr G Hughes, for the Rhiw Parish Cottages photograph. And a special thanks to Mr William Troughton, from the National Library of Wales, for his prompt and expert help.